An important key to economic development in any metropolitan area is public transportation. 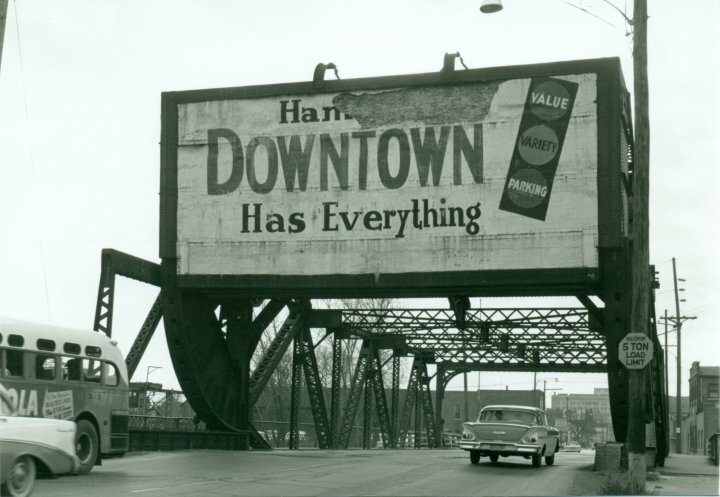 In order for downtown Hammond, Indiana to develop as a central commercial district, it was necessary to provide a transportation system to bring in shoppers who lived beyond the central downtown, to the business district. 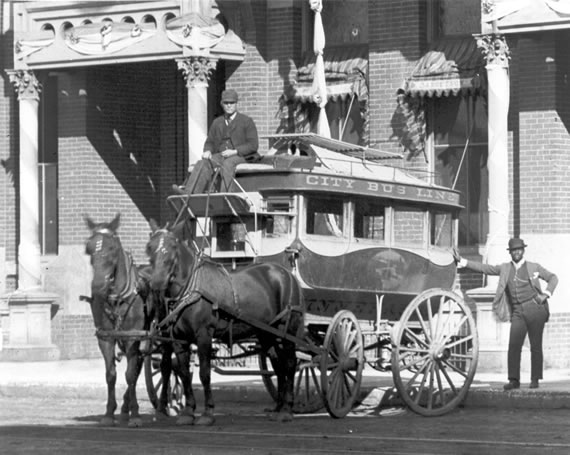 Not everyone had their own automobile so having a bus or streetcar was important. There was a strong reliance on horse drawn vehicles in the early part of Hammond's history. This required another industry to support this type of transportation: a network of blacksmiths, livery stables, harness shops, feed stores, all of which existed in the Hammond business district. 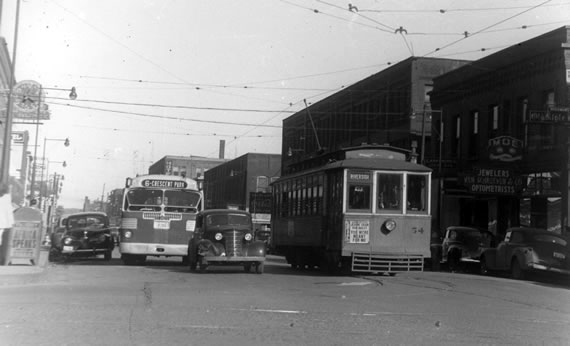 When the streetcar was introduced and electrical power cables were installed overhead, these small supportive companies either changed their mode of operation or went out of business. You can monitor this transition by viewing the street scenes that have horse drawn carriages, then a mix of horses and streetcars, then just street cars while horses were eventually banned from downtown Hammond. 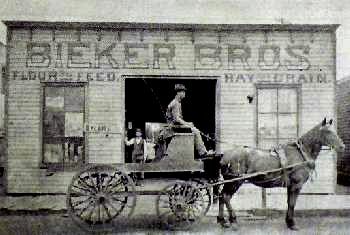 The Bieker Brothers family made the transition from serving the business community when it depended on the horse. They moved from Feed - Hay and Grain to the construction trade with a family owned business that survived for almost a hundred years. Nick Bieker, HHS '59, still lives in the Calumet Region. The City of Hammond established a network of rail tracks throughout the downtown area and built electrical lines overhead for power. 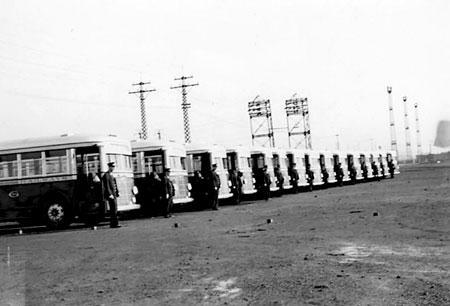 The streetcars moved throughout the area, joining up with other cities so the transportation network could be expanded. This allowed the public to travel and commute to their jobs, schools, and for shopping. This trolley is much like the one use in Hammond. Cities throughout the country provided public transportation using the streetcar line. A picture of the inside seating arrangements of the electric trolley. Electric Railway Company . . .
"Originally founded in 1892 as the Hammond Electric Railway Company, it went out of business after just a year of operation. The company only had a short run of two miles of track down Hohman Avenue. It was purchased in 1893 by a group of Hammond businessmen and renamed Hammond, Whiting & East Chicago Electric Railway Company. Its routes and tracks expanded to cover twenty-five miles and served the cities for which it took its name. The South Chicago City Railway bought the line in 1896 and then equipped it with the familiar green street cars that lead to its nickname the "Green Line". In 1903 fifteen cents would get you a one way trip to the Chicago Loop verses the seventy-five cents that the steam railroads would charge for the same distance. But the steam railroad lines quickly lowered their fares in the face of this new competition. The trolley line rarely made a profit. With that in mind the glorious era of street cars in the city of Hammond came to an end on Sunday, June 9th 1940, when the line ceased operations." 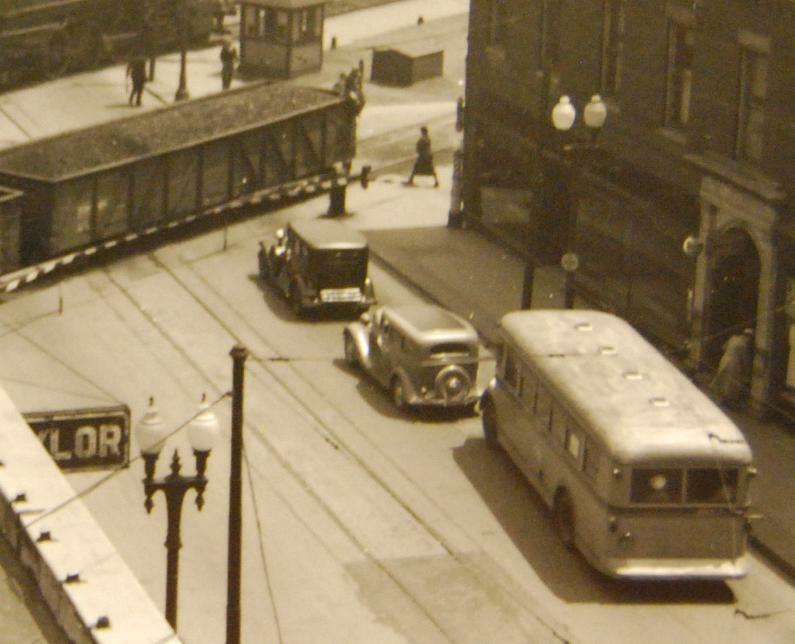 Modern streetcars were not without their problems, especially in northwest Indiana. This photo was taken in South Bend showing what happens when you have a little Lake effect snow. Notice the horse draw sleigh on runners and how it is about to pass the stalled streetcar. There were many problems with streetcars as a mode of public transportation. First, developing the infrastructure of overhead electrical lines and placing the track down public roads, prevented the streetcar from any flexibility with its route. Second, they could not go out into the adjacent neighborhoods and therefore they were somewhat restricted. The introduction of the city bus addressed those issues. City buses did their best to stay on time but fell victim to delays caused by trains in Hammond, Indiana. This photo is from O.W. Bodie's glass plate negatives on file at the Calumet Archives at Indiana University Northwest. There were arguments back and forth as to the safety of public bus service. Here, a Hammond bus has plowed into the back of another vehicle and must be hauled away. Proponents of horse drawn carriages and electrified street cars probably entered into the discussion on which mode of transportation was the safest. 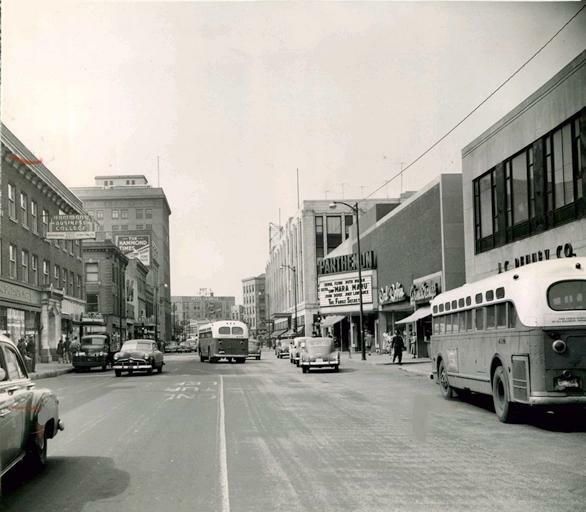 During the transition from streetcars to buses, they were required to share the road. When you added personal automobiles and delivery trucks, you guaranteed traffic congestion. Animals were eventually banned from downtown streets and a new era of motorized traffic was adopted. out of the bus barn near 150th & Columbia Avenue. 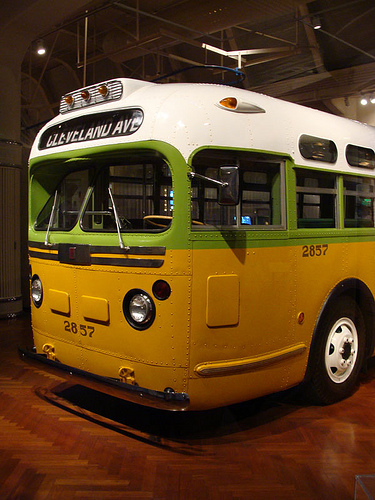 Another style of bus came out of neighboring Gary, Indiana but represented the style and look of the early 1940s design. City bus service in Hammond required the development of an infrastructure to support this new transportation utility. 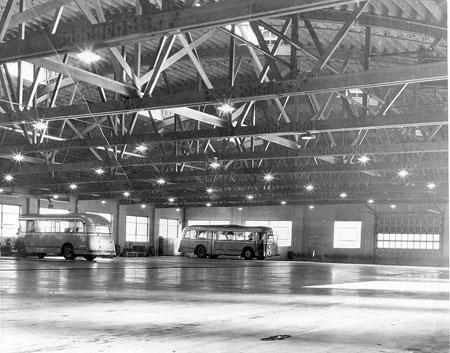 Here in an interior picture of Hammond, Indiana' bus barn. Hammond bus drivers proudly stand before their individual bus before they leave on their appointed rounds. The development of strategic routes provided public transportation to the greatest number in the most efficient manner. 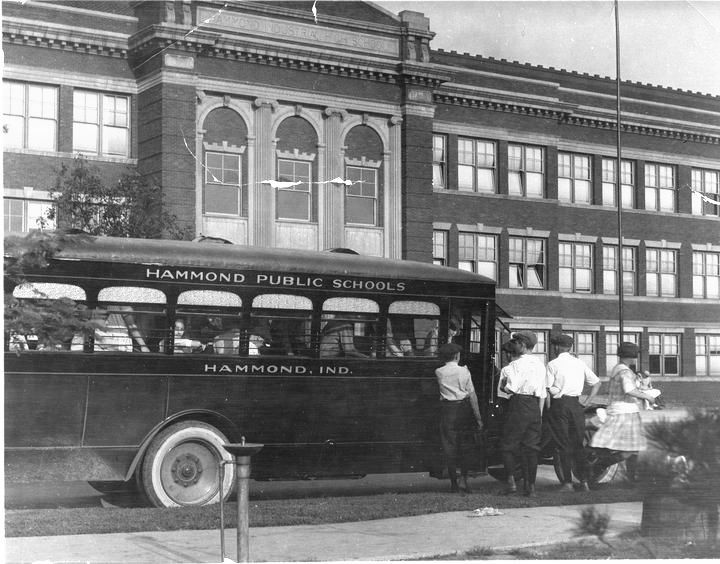 This is the bus most of the kids remember if you grew up in Hammond, Indiana in the 1950s. It is a General Motors bus first released in 1944. The model and style continued deep into the 1950s. This is the bus we anxiously waited for in the rain, in the snow, in the freezing winter. the weekends) if you walked to school and walked home again sometime during the week. You rationed your bus ticket rides to save money. and the partially obstructed view of where you were going. 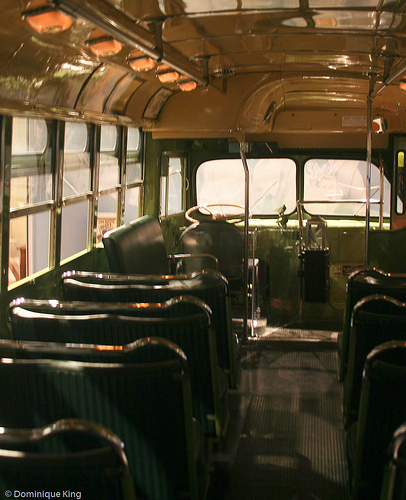 A very simple but utilitarian design that made the bus, "the bus." 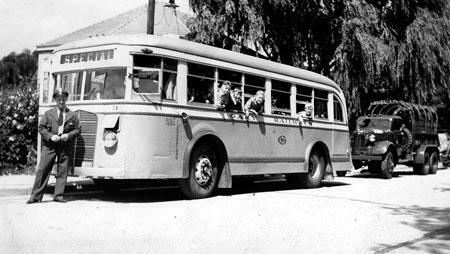 This is the 1944 GM bus with the same exterior paint as the one in Hammond during the 1950s. This bus, however, is the bus that Rosa Parks rode in Montgomery, Alabama in 1955 when she refused to give up her seat and move to the back of the bus "...'cause my feets are tired." It is now a historical treasure in the Henry Ford Museum, "Greenfield Village", in Dearborn, Michigan. 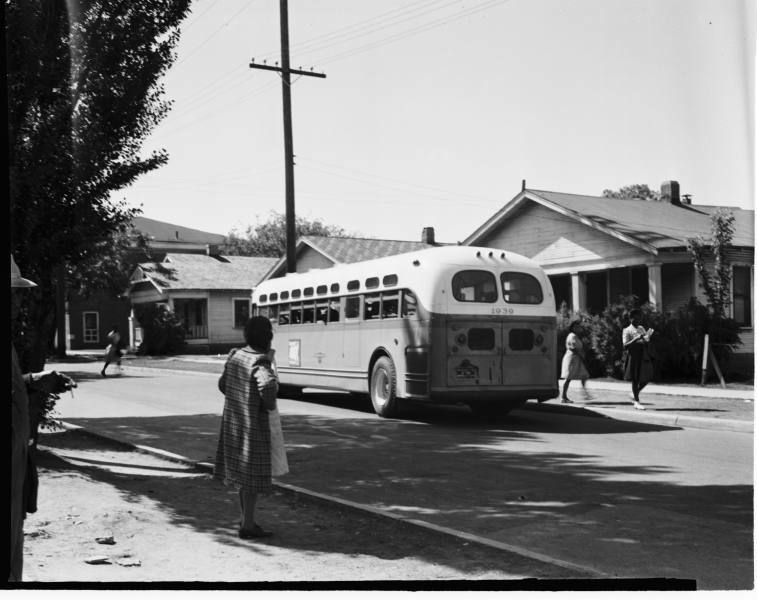 The incident on this bus was responsible for initiating the Civil Rights Movement that ended segregation in the South and throughout America. 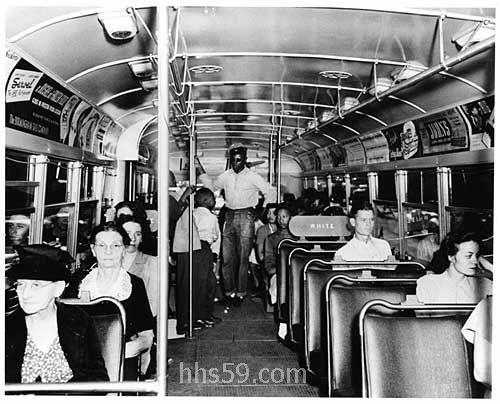 Here is a photo taken prior to 1955 showing the segregation on a city bus. The marker on the back of the seat (center right) shows the color boundary. 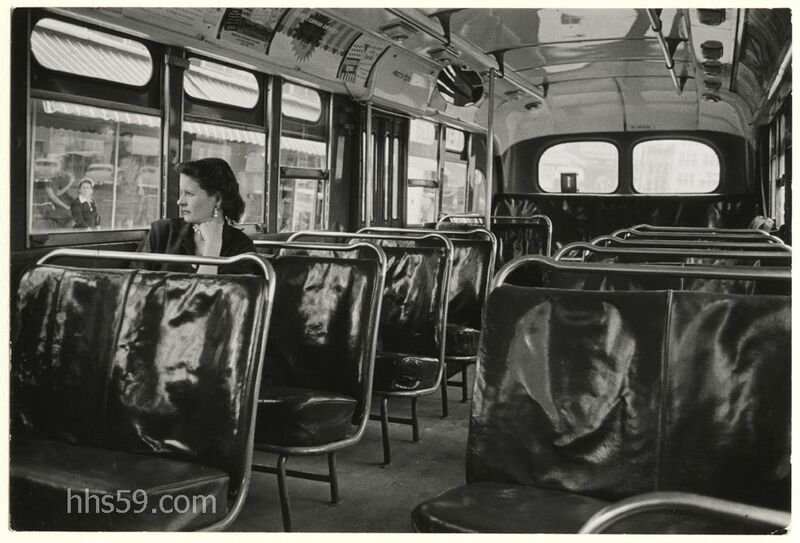 White passengers sat in the front seats while African American passengers were required to sit behind the White boundary sign, even when all of the rear seats were taken and there was standing room only. Rosa Parks refused to move to the back of the bus when ordered by the driver. She was arrested and paid a $25 fine and was jailed briefly. Americans... Tiebels Family Restaurant was an exception. Everyone was welcome at Tiebel's! near the Parthenon Theatre is a fastback 1951 Chevrolet. Looking South on Hohman from State Street. and for shopping. The city bus was the vehicle that made it all possible, regardless of income and whether you had a car at your disposal. Traffic slows in downtown Hammond but the buses continue to run.